In Will & Caro's transcendently inspiring wall art, hand-folded origami butterflies soar into a blue sky. 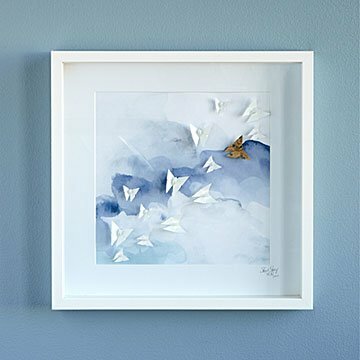 A flock of snow-white butterflies―and one individualist in color―soar into the clouds in Will and Caro's exhilarating blend of traditional 3D origami and evocative watercolor sky print. The butterflies, made from the highest quality Chiyagami paper, are individually hand-folded and attached to the print, so each artwork looks just a little different from the next. Origami lovers are sometimes challenged with how to display it; here's a brilliant solution. This transcendently inspiring artwork lifts hearts and re-ignites dreams. Handmade in Melbourne, Australia. Born in Australia and Finland, respectively, Carolyn Wong and William Du both grew up in creative families. Carolyn’s father was in the fashion and tailoring industry. As a little girl she paraded in her father’s beautiful creations. William developed his creative skills drawing alongside his brothers, all self-taught. Will and Caro create stunning art pieces with a story to tell, primarily working with traditional Japanese paper. They love its simplicity, purity, and delicacy, and its contrast with our era’s technology. Carolyn has a fascination with geometry balanced against subtle textures and intricate patterns, while William is intrigued with movement and disorder. Collaborating in their Melbourne studio, they create designs that evoke calm, yet also tantalize the senses. Would definitely recommend this beautiful work of art. It is a lovely, airy and peaceful work of art. A beautiful addition to any home.